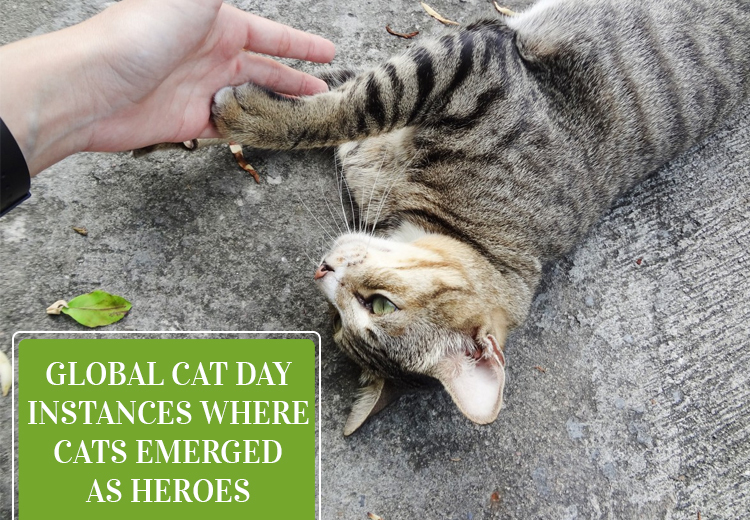 Global Cat Day refers to the day when cat lovers and compassionate pet lovers all over the world come together to encourage policies which safeguard and promote the rights of their beloved canines. It is celebrated annually on October 16th and recently replaced the annual national feral cat day which was celebrated in 2001. Cats are one of mankind’s greatest companions and demand nothing in exchange for giving everything in return. The presence of cats has also been recognized as a vital factor behind improving the body’s ability to heal itself and producing new cells. Cat lovers who pet their cats regularly have confessed to enjoying instant relaxation and are quite a source of comfort for those involved in hectic work-lives. Not only this, but it has also been revealed by vets that enjoying the company of your furry munchkin can reduce the anxiety, encourage the level of communication with others as well as reduce feelings of isolation. Tara, a small little cat from Bakersfield, CA proved her immense loyalty and bond to her cat parents by safeguarding the life of their 4-year-old Jeremy risking her life during a vicious attack by a street dog. Jeremy was dragged off his bike by a local neighborhood dog and was just about to be hurt badly, when Tara reached the spot, attacking the dog viciously and safeguarding the small little boy. The ferocious dog decided to run away from the scene due to Tara’s valor earning the undying love of her cat owners after her bravery. We have all seen cases where the victim dials 911 despite battling a threat to his/her life, hence saving the day and his life from a potential murderer. However, we have rarely heard of a case where a cat dialed 911 on his own accord. This fascinating incident took place in Dec 2005 when Gary Rosheisen who was battling mini-strokes and osteoporosis and had adopted an orange striped cat called Tommy, fell out of his wheelchair. Rosheisen would have been fatally affected that day if not for Tommy, who emerged as the hero of the day. The plucky cat dialed the speed dial button on Gary’s phone dialing 911. Police officials who arrived at the scene were only able to save Gary from his critical situation because of the piece of mind demonstrated by Tommy. Gwen Cooper decided to rescue and adopt Homer, a blind skinny black cat who was all alone because of his lack of vision without any inkling of the fact that she would be alive one day simply because of the bravery of her cat. Cooper woke up one night to see her cat Homer, glaring and ferociously scratching an intruder who would have killed her if not neutralized at that very instant. Homer’s aggression forced the intruder to run away from the scene hence avoiding the occurrence of a fatal crime. Cats enjoy a sense of smell which is 15 times stronger than that of humans with some claiming that they are as capable as to sniff out the presence of cancer within the system of a human being. Wendy Humphreys, a 52-year-old Britisher is certainly one such advocate. Humphreys’s cat Fidge, who she had adopted when she was just 8 weeks old had suddenly developed a habit of jumping on to her breast whenever she sat down leaving her perplexed. Wendy who developed bruises on her breast as a result of this habit decided to consult a doctor, who detected a lump in her breast indicating that she was suffering from breast cancer. The 52-year woman believes that her beloved cat has emerged as nothing short of a life-saver with his keen sense of smell. Cats are amazing creatures that enjoy powers way beyond our imagination. We encourage every cat lover out there to raise their voice in favor of the rights of your furry munchkins on global cat day. « Adopt A Shelter Dog Month: Why They Need You?